This elegant style is created by parting hair into two sections, and braiding each. These sections are then brought across the top of the head to form the “crown,” before being secured with bobby pins. Crown braids are a great option if your bridesmaids all have longer hair, and can be worn in a variety of ways. You can go for a full crown, or leave part of the hair down in gentle curls giving the appearance of a braided headband. A great option for any women who may have short hair but desire a more dressed or formal appearance, headbands can be used to accentuate virtually any hairstyle. Choose from rhinestones, to feathers, and many more eye-catching options to keep your bridesmaids feeling beautiful and confident while taking the stress out of planning more complicated styles. To really up the originality of your ceremony, consider allowing each bridesmaid to choose her own hair piece or headband based on a desired color or style that will flow with the rest of the wedding wardrobe. Any hairstyle can be given new life with the addition of gorgeous floral accents. 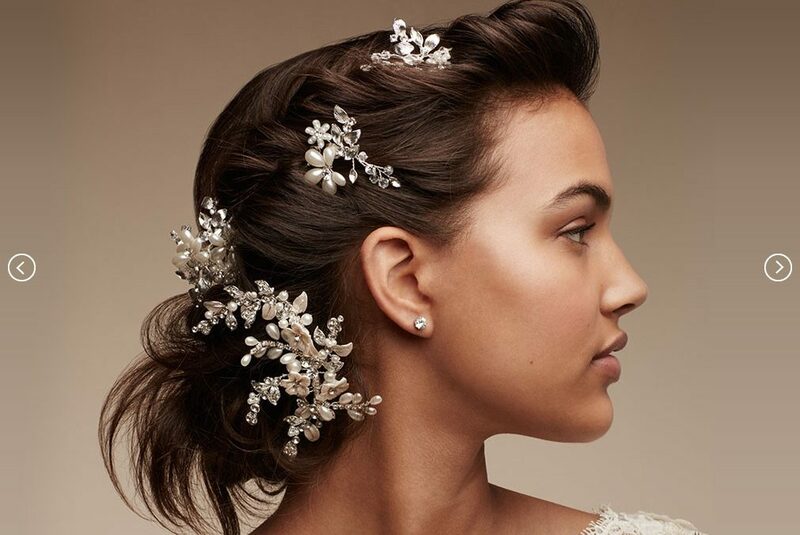 Whether it be baby’s breath woven into a gentle side braid or orchids tucked into a sleek bun, adding flowers to your bridesmaids’ hair is sure to draw attention. Faux flowers are obviously the best option as they are more durable, and you wouldn’t want any hair malfunctions as you and your bridesmaids enjoy dancing the night away. Also known as a “cascading braid,” this hairstyle works wonderfully with soft waves and looks impeccable for formal events such as weddings. While any stylist you visit should know how to achieve waterfall braids, it’s also a fairly easy style to achieve on your own if you and your bridesmaids are doing your hair on your own time. Essentially, the look is created by something similar to a French braid; however, instead of keeping all of the strands tucked in the braid pieces are dropped down to create the look of elegant, cascading curls. You can find a more detailed tutorial and pictures of this style here. If you’re into keeping things simple and yet still want to keep a semi-formal appearance, side ponytails for your bridesmaids might be a good choice. Not only are they easily achievable and complement a wide range of hair types and face shapes, your bridesmaids will be comfortable and confident with a style that will hold up throughout the night’s events. For a fully unique lineup of hairstyles you won’t find in anyone else’s wedding day, consider allowing each bridesmaid to simply choose a formal style of their choice, within reason. Doing so will ensure everyone is happy with the end results and feels their best, which will in turn make your day flow smoother and feel more relaxed. Weddings are meant to be fun occasions, and giving your bridesmaids the freedom of choice is a great way to allow them to express themselves.